Michaels Entertainment Group has announced that on Thursday, July 14th, Bret Michaels brings his passion and showmanship back to television when he performs on ABC Television Network’s Greatest Hits series which airs in the 9 pm EDT/PT timeslot. This highly anticipated television event will see Michaels performing to millions of homes worldwide, bringing viewers along with their family and friends a night of great music and an epic party not to be missed. As people around the globe are enjoying their summer vacations it is always a must to incorporate the right music and vibe to set the ultimate soundtrack to wherever your soul takes you. Multi-platinum recording artist, global entrepreneur and philanthropist Bret Michaels answers this call as his 2016 “Party Starts Now” world tour remains a must see cryo/pyro filled mega-party, playing to record breaking audiences all year long. The “Party Starts Now” tour is a constant, playing to sold out crowds on this concert trek leaving fans and event organizers more than satisfied. 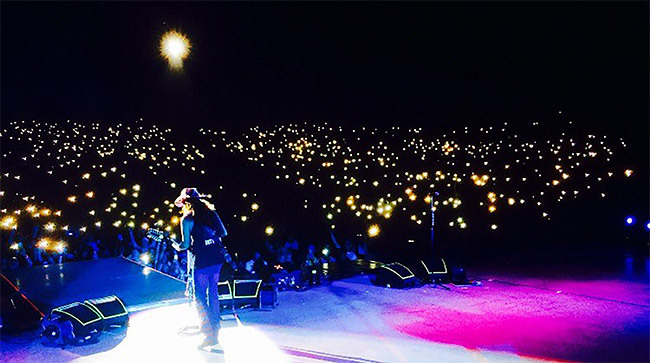 Look no further than this past July 4th weekend where Michaels performed a string of sold out concerts in Gering, Nebraska; Kokomo, Indiana; Junction City, Kansas and Moapa, Nevada or last weekend’s shows in Pocatello, Idaho; Salt Lake City, Utah & Richfield, Utah. Hosted by Arsenio Hall and Kelsea Ballerini, each episode of Greatest Hits highlights a five-year period celebrating the biggest hits from that time. During the show’s six week run, iconic music artists, as well as today’s music chart-toppers, will take the stage and perform the songs that defined the 1980s, 1990s and 2000s for special solo performances, never-before-seen duets and incredible tributes.